People often confuse the terms voice and speech. Voice is produced by the larynx, or voice box. Voice is not always produced as speech but can be heard as a baby coos or as the sound we produce when we laugh. 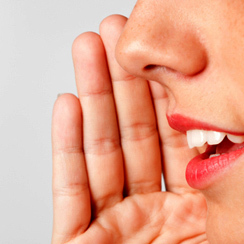 However, when we talk about voice as a method of transmitting speech, we talk about pitch, loudness and quality. Pitch is the frequency of your speech and refers to how high your pitch is when you speak or how low your pitch is when you speak. Loudness refers to the intensity of your speech; are you using a quiet voice appropriate for a fine dining experience or are you using a loud voice appropriate for a sporting event? Finally, vocal quality focuses on issues such as nasality, breathiness, and hoarseness. Your voice is your unique signature; it defines your personality, your mood and your auditory identity. If you use your voice well and you articulate precisely, your communication skills will be very effective. However, if you use your voice in an unhealthy way, it will change the way that you sound. These changes, which result from vocal abuse such as shouting, repeated throat clearing, using inadequate breath support, and/or speaking with persistent glottal fry, may result in vocal nodules or polyps. The nodules or polyps can cause your voice to sound hoarse or breathy. Other vocal qualities, such as nasality and shrillness, can also detract from a dynamic, resonant voice. If you are experiencing any of these symptoms, it is important to be evaluated by an ENT (Ear, Nose and Throat Physician). After a thorough evaluation and diagnosis, the ENT may recommend voice therapy from a Speech/Language Pathologist. Therapy would focus on learning good vocal hygiene, reducing/stopping abusive vocal behaviors and learning how to use adequate breath support and loudness for good speech and voice production. A Speech Pathologist or Dialect Coach can also work with you on reducing distracting vocal behaviors such as “upspeak”, speaking excessively fast, and the use of fillers such as “like”, “you know”, “uh” and/or “so”. These distracting vocal behaviors can interfere with your communication skills and make you sound unsure of yourself, immature, and fatigued. Speaking with glottal fry at the end of a phrase or sentence can make your voice sounds weak and as if you lack the authority of your convictions. Although the content of your message may be very powerful and well thought out, the impact of it will always be diminished if it is not delivered with a good voice and precise articulation. The way you speak makes a powerful first impression. Working with a Speech Pathologist/Dialect Coach can give you the skills you need to have a strong, resonant, powerful and effective voice for auditions, voice-over acting, stage or screen work, corporate presentations, and public speaking.